Beautiful villa with pool surrounded by greenery, 4 double bedrooms, 4 bathrooms. Harmony and well-being. Peace and relaxation. Elegance and simplicity. Imagine a place to live a holiday with all five senses: Casa Blu is all this and much more. First, the view: the blue expanse of the sea and the green of Mediterranean vegetation will leave you breathless. Hearing: the silence of nature and the singing of birds will convey tranquility and inner serenity. The smell: crossing the avenue leading from the house to the pool you will be wrapped in the intense and inebriating scent of the aromatic plants of the garden: rosemary and sage hedges, laurel trees, mint and basil leaves. The taste: you will enjoy the goodness of the products of the Villa's garden, genuine flavors and Sicilian flavors. The feel: a dip in the crystalline water of the pool and you will feel like touching the paradise! Casa Blu is a modern design featuring a strong contrast between white and blue, the colors of the sea that best interpret the island's atmosphere. The Villa extends over a property of about 2. 450 square meters. From the entrance gate you access the parking area and the main entrance of the house. You enter a large lounge with dining area, comfortable and stylish sofas and armchairs, fireplace and fully-equipped kitchen. On the ground floor there is a large bathroom with shower and laundry area. The living room has three large glass doors on a large covered terrace, furnished with a table in majolica and sofas, overlooking the pool and the surrounding scenery. On the first floor there are four double bedrooms, three with sea view terrace and one with terrace overlooking the mountain, and two bathrooms with shower. Each room interprets the Sicilian atmosphere through the contrast between the white and the colors of the island: the lemon yellow, the green of the countryside, the blue of the sea, the sky turquoise. Outside you will find the sea-view swimming pool surrounded by Sicilian olive trees and fragrant jasmine plants. From the swimming pool you can admire an incredible view of the Sicilian countryside and the blue sea. The pool area is furnished with a chaise longue, shower and external bathroom. Relaxing in the pool is guaranteed thanks to the bar corner with stools and the area set up with comfortable sofas in the shade of the olive trees, where you can enjoy fantastic cocktails and aperitifs at all hours of day and night. There is also a bowling alley, very shaded by the dense vegetation surrounding it. Near the pool is the large patio equipped with an outdoor kitchen, fridge, wood-burning oven and barbecue; The patio is furnished with table and chairs for up to 10 people. Behind the patio is the vegetable garden with seasonal fruits, whose products are at guests' disposal. 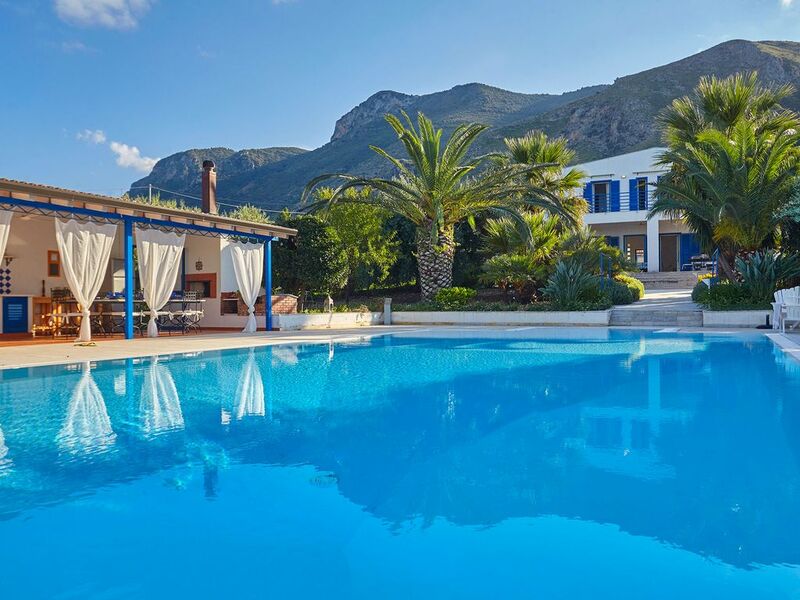 Casa Blu is the ideal place to spend unforgettable moments, surrounded by Beauty and absolute comfort, and breathe the unique atmosphere of Sicily's most authentic. We spent eight days at the villa, and just loved it. The house is well equipped and well located to explore northern Sicily. The outdoor space and pool are just delightful and the views are marvelous. Marina and Viviana were extremely helpful. They promptly answered every question that came up before and during our stay and made great suggestions for what to do and where to go. They arranged a marvelous full day boating excursion, and introduced us to Chef Gabriella who prepared a truly memorable meal for our group, using locally sourced ingredients. The villa makes a great base for exploring northern Sicily --or for just relaxing and taking in the wonderful gardens and marvelous views. We highly recommend it. We can't rate Casa Blu highly enough! The villa itself is amazing but the outdoor pool, kitchen, bar and seating just make the place exceptional. As other reviewers have said, it really is as stunning as the pictures on the website if not more so in reality. We are a family of 4 with 2 boys who just loved the pool. The scenery is stunning and the villa is of a really high spec. Viviana and Marina are fabulous and on hand if you need them with advice on trips, restaurants etc. We would definitely recommend and have no doubt that we will return! Perfect house 30 min from Palermo! Thanks for staying in Villa Blu!! The house is perfect, clean and very well equipped, which is not always the case in Italy. The pool is huge and has a great sea view. Very nice kitchens, bbq, pizza oven, bar at the pool. Some nice beaches closeby (30 min), Palermo (30 min) and a small Village for shopping and some restaurants (10 min) . Would recommend it!!! Wir waren in der Pfingstwoche 5.6.2017 bis 12.6.2017 (2 Familien - 4 Erwachsene und 4 Kinder) dort. Das Haus und die gesamte Anlage ist einfach genial. Die Ausstattung ist einwandfrei. Vom Pizzaofen und Grill sowie Innen- und Außenküche, Spielsachen, Boccia-Bahn, 4 Kühlschränke, Basketballkorb, schnelles WLAN, 2 überdachte PKW-Stellplätze, super Wohnzimmer, 4 Badezimmer und 5 Duschen (größer als das Badezimmer mancher Häuser) große Terrassen und vor allem dem genial großen Pool (ca 15m x 8m ist alles da was man für einen entspannten Urlaub braucht. Nespresso-Maschine, ital. Espressomaschine, Küchenutensilien, 2 Geschirrspüler, Waschmaschine, Trockner, usw. ist natürlich in dieser Kategorie Pflichtausstattung. Alles einwandfrei und sauber. Für Kinder ist der Pool mit Sprungbrett ein riesen Spaß. Wir haben jede Sekunde in dem Haus genossen. Der Blick ist herrlich. Der Garten bietet frische Zitronen, Pflaumen, Mandarinen, Tomaten, Minze, usw. Danke an Viviana und Marina für die einwandfreie Organisation. Auch zu empfehlen: Marina und Viviana haben uns für einen Tag ein Segelboot (Oceanis 361 Clipper mit Bad, Küche, 3 Schlafkojen, usw.) mit Skipper (Roland) organisiert. Das war einen Tag lang herrlichstes Segeln zum fairen Preis, ankern an den schönen Hausstränden Palermos, nur zum genießen. Roland spricht Italienisch, Englisch und Deutsch (Südtiroler). Top organisiert inkl. Getränke (Wasser, Bier, Wein) und Essen während der ganzen Zeit inklusive. Der Trip war auch für die Kinder toll (sie durften das Steuer übernehmen und in den Buchten schwimmen, schnorcheln und vom Boot ins Wasser springen. Das Haus liegt ruhig, zum Zentrum von Palermo braucht man 40 Minuten. Ein Tagestrip zum Etna oder nach Taormina ist mit einem Mietwagen kein Problem. Noch eins: Die Bilder von der Anlage in diesem Profil sehen aus wie professionell fotografiert aber wenn man dort ist, ist der Eindruck der Anlage wirklich so genial. Wenn wir wieder nach Sizilien fahren werden wir bestimmt wieder dort Urlaub machen. 100% empfehlenswert und dank Marina und Viviana TOP organisiert. Es ist sogar möglich einen Sternekoch zu buchen der einem ein Mehrgängemenu im Haus zaubert. We hope to meet you again in our Bella Sicila! Within walking distance of the wonderful beach of Torre Normanna, the marina of San Nicola l'Arena and the beautiful castle of San Nicola. Near the ruins of Solunto, at the fishing port of Aspra and Porticello for those who want to buy freshly caught fresh fish. Close to the wonderful coast of Mongerbino and ideal for a visit to Bagheria's historic homes. On the way to discover the richness of the Arab-Norman route, visiting the cathedral of Monreale, Cassaro di Palermo, the cathedral of Cefalù. The price includes bed linen, bathroom towels and pool towels for each guest. It doesn't include heating consumptions in winter period (on request, the extra cost is € 250,00). Pool not heated. Late check in after 21.00 available for extra € 50,00. Baby camp bed and highchair available.